. 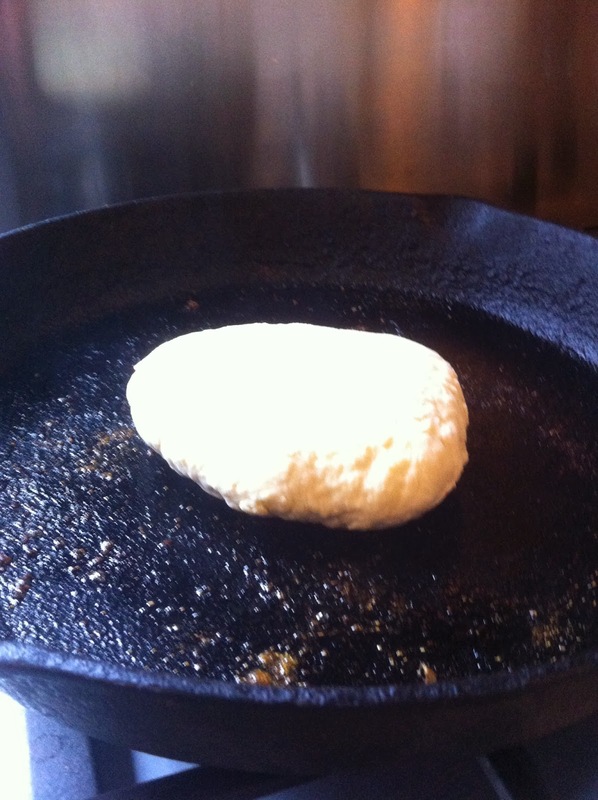 No bread is an island: BREAD IN 13 MINUTES - NOW WITH PICS! BREAD IN 13 MINUTES - NOW WITH PICS! It's been very remiss of me, but I still hadn't posted a pic of this bread - so here's a veritable portfolio! I've been extolling the virtues of this easy,versatile bread on this Local Mumsnet thread - and when one of the posters on there, blueyama, made it and asked, "Is this how it's supposed to look?" I realised that I simply have to get a photo of the bread on this. 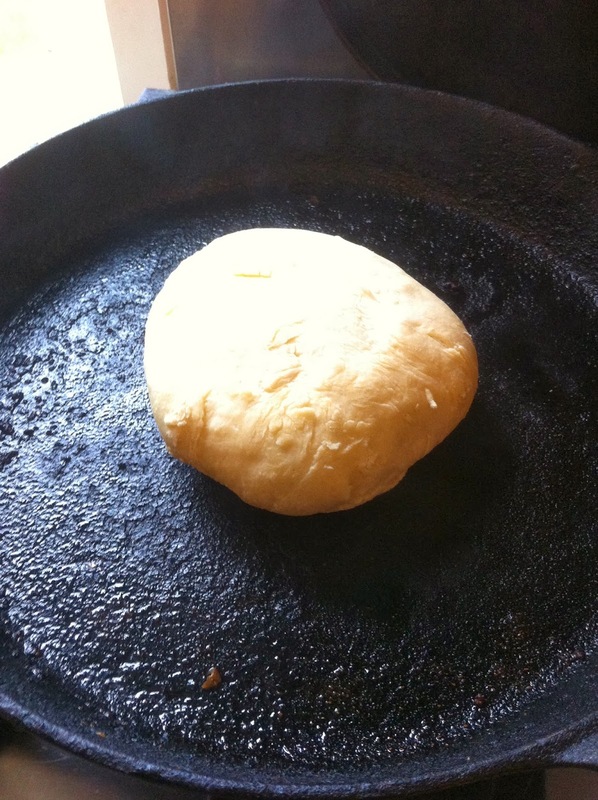 I put the frying pan on a low heat, then followed the recipe below, shaped the dough into a flattish disc, popped it into the frying pan and turned the heat up to medium(ish) for 5 minutes. The top - slightly singed, which mattered not one iota! And split, prior to spreading with olive oil and adding vegan cheese, mushroom pate and sliced tomato (from the freezer. 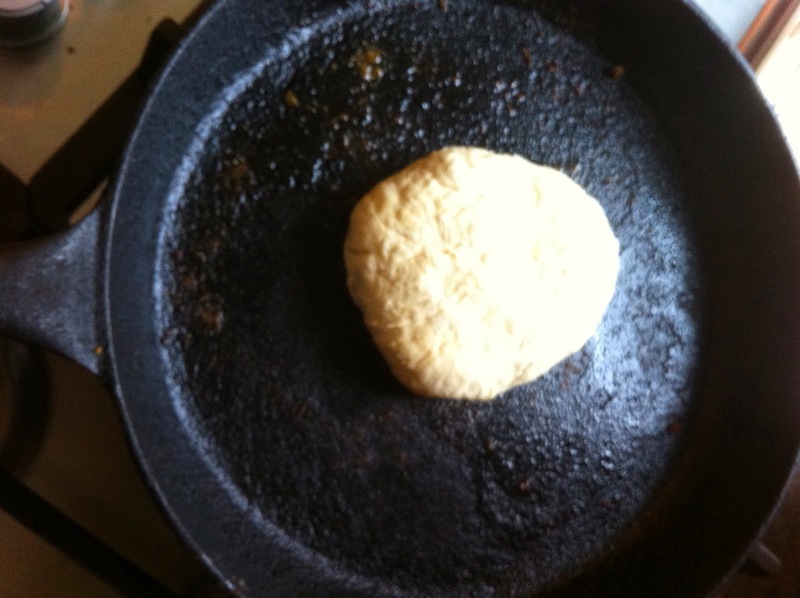 I needed some bread in a hurry for my wife – who isn’t fond of my wholemeal rolls – so I made a quick soda bread in the frying pan, which took me all of 13 minutes. 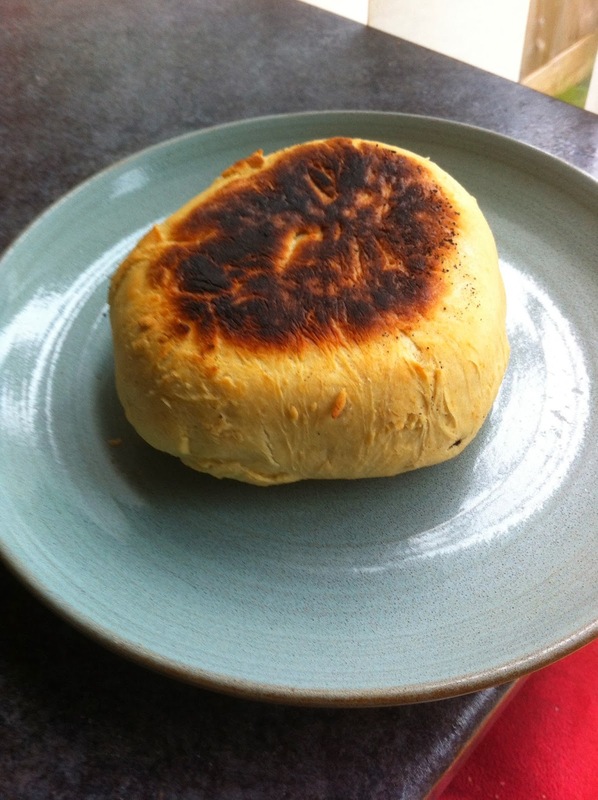 Mixed into a soft, squishy dough – knead it briefly – pressed it out into a disc about 1.5-2cm thick and popped it into a frying pan on a medium heat. This took me about 3 minutes from first having the idea. Baked it for 5 minutes each side and wrapped it in a tea-towel whilst I made her an omelette. 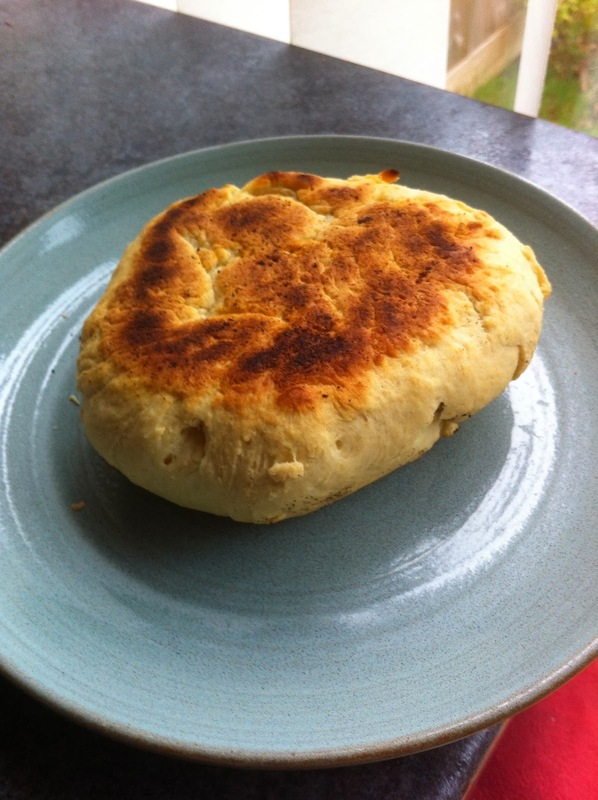 The result was a large soft, warm bap – which went down very well! No pics, I’m afraid, since it disappeared very quickly. Total cost - less than 4p for the ingredients. Made a version of this several times over the past week. First I trebled the ingredients - and managed to get 3 in my 30cm cast-iron frying pan. One for immediate use and 2 for the freezer. Then I made one using Dove's wholemeal bread flour and a teaspoon of baking powder. To this I added a heaped dessertspoon of chopped tomatoes with a good glug of oil from the jar. I had intended to include half a teaspoon of Marigold (instead of salt) but I forgot. However, it didn't need it - the bread was so tasty that I was munching on it whilst waiting for my leftover curry to heat up. And today I thought I'd make some sizzlers using this method. I used the above recipe and divided the dough into two. I rolled them both into circles, placed a strip of fried mushrooms over the middle and covered them with a little grated vegan cheese and some yeast flakes. folded them over and placed them in the warm frying pan. After adjusting the heat I cooked them for 4-5 minutes each side. And this time I have got some pics! They were very tasty, although I could have done with more mushrooms! Salt's a bit difficult, since it's a personal thing. I nearly said 8th of a teaspoon of salt, but that becomes a little unwieldy. Still, you'll know next time!